You want your home to look presentable always, both day and night. Many people will see your house and get a first impression about you, whether they’re house guests or just passing by. You might have recently gotten a new door, windows, or a paint job, but none of that is noticed once the sun goes down. 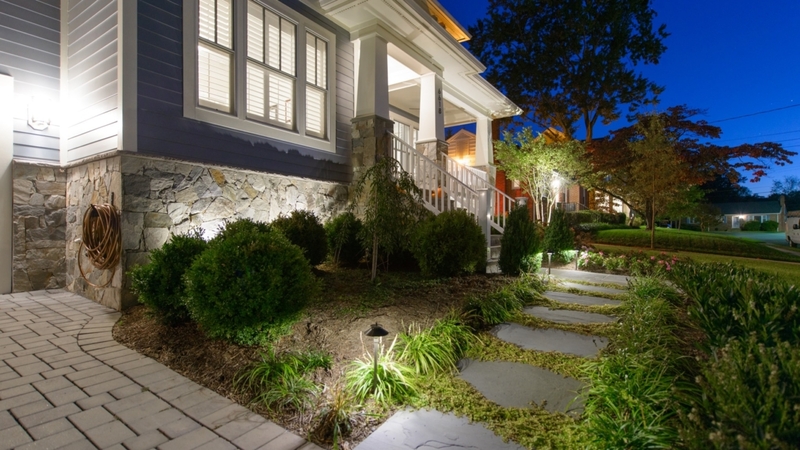 Strategic landscape lighting can transform any home or commercial building. Lights for your home’s exterior come in many shapes and sizes. They also come in many forms and can be placed in various areas, as well as in different fashions outside your home. All your outdoor lighting needs can be met when you contact Groff Landscape Design in Northern Virginia to help design and install lighting for your property. There are more kinds of possible lightbulbs that can be used for landscape lighting than you may think. There are fluorescent, high-intensity discharge (HID), light-emitting diode (LED), halogen lights, and more. Fluorescent lights emit a glowing white light that is produced by a chemical reaction and give off invisible UV rays. Fluorescent lights are an affordable and energy efficient option. HID lighting is also electric and produced by a chemical reaction, but they are generally more fragile and may not be as practical. LED lights are made of filaments that provide a brighter light using less heat. They last a long period of time but get dimmer as they grow older. Halogen lights are generally round lamps popularly used for residential and commercial lighting. When deciding on landscape lighting, think about how you can get creative with the types of lightbulbs. Colored lights are a good way to set the mood or match the weather with warm and cool tones. Use different colors in various parts of your property to bring out certain colors in your yard. A blue or green light can accent shrubs, bushes, trees, and grass. You can also get more creative by using red and orange lights to create fire-like tones on the edges of your yard, or yellows to bring out any yellow tones in plants. There are endless ways to be creative with colored landscape lighting, even if it’s just different tones of white or simply a change in brightness. When someone mentions landscape or yard lighting, what pops into your head? Path lights are a very common way to light your property, along with many more. Groff Landscape Design can also install deck lights, well lights in flowerbeds, post cap lights on any posts, spotlights or floodlights in various places, and many more. Client experience is very important, so Groff’s landscape lighting installation services will make sure you are satisfied with the end result. We offer both design and installation services, so you will be left with the home of your dreams. Contact us today online or by phone at (703) 999-8225 to begin beautifying your home!